Winter is still underway for most people in the U.S., but that doesn’t mean it’s too early to start looking ahead to Halloween. Before you know it, winter will be over, spring will be here and that’s only around six months before the greatest holiday in the world (at least to me, anyway). One reason I’ve decided to get Halloween prep going early this year is that it’s happening on pretty much the best day of the week: Saturday. I remember as a kid thinking that there was nothing better than having Halloween fall on a Saturday. You didn’t have to go to school that day or the next so you could spend the whole day celebrating on Saturday and sleep in on Sunday if you’d stayed up too late indulging in all that chocolate and other goodies. If you’re like most of country, you’re probably spending a lot of time at home right now trying to stay warm and avoid the bitter cold and record amounts of snow. I live in a milder climate than those residing back east, but we’ve still had some snow up here on the mountain where I live. It’s a great time to pull out your decorations and start organizing. If you’re anything like me, you probably tossed all those Halloween decorations into boxes on November 1 so that you could start getting ready for Thanksgiving and Christmas. 1. Throw out old/broken decorations. Got a plastic jack-o-lantern with a crack in it? Toss it. 2. Organize outgrown costumes to donate. Many organizations will accept gently used costumes to give kids in need a fun Halloween. 3. Make lists of needed items. If you’re planning a party and not sure what supplies you have and what you need, this is a great time to figure that out. Before making plans, ask your kids (especially teens and tweens) what they’d like to do. If you’re thinking of a big party, but they just want to trick-or-treat, you might need to make some adjustments. 5. Start thinking about costumes. The earlier you decide on a costume, the most cost-effective it will be as many Halloween websites run specials throughout the year before fall. You can also avoid the frustration of figuring out exactly what you want to wear, only to find out they’ve run out of stock in October (trust me, I speak from experience). 6. Make a Pinterest board. Want some ideas for decorating, costumes, parties, food and more? Head on over to Pinterest and check out all the great posts people have put up there for Halloween. My own board, The Queen of Halloween, has some really awesome stuff that I’m planning to try this year. Every year, it feels like I have all these decorating different ideas I want to try but by the time October rolls around, I’m so engrossed in all the celebrating and going to scare parks that I don’t get around to most of the decorations. 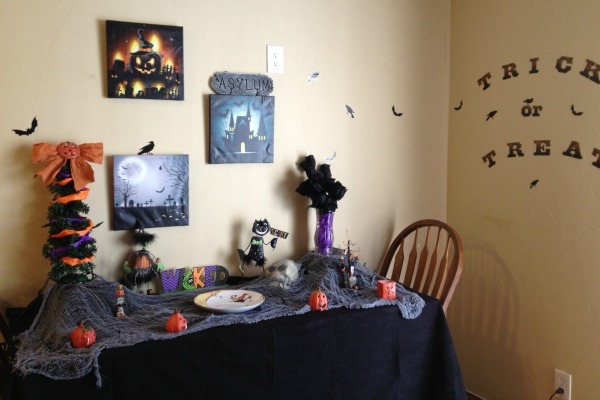 If you’re planning any big projects, such as making your own DIY Halloween Village (I swear I’m going to try it this year, look at how cute it is! ), the sooner you start the better. Summer is a great time to work on these kinds of projects. Have you started making plans for this Halloween? Let me know how you’re prepping for the holiday this year. This article was posted in Uncategorized and tagged Adult Halloween Ideas, Halloween. Bookmark the permalink. Follow comments with the RSS feed for this post.Post a Comment or leave a trackback: Trackback URL.